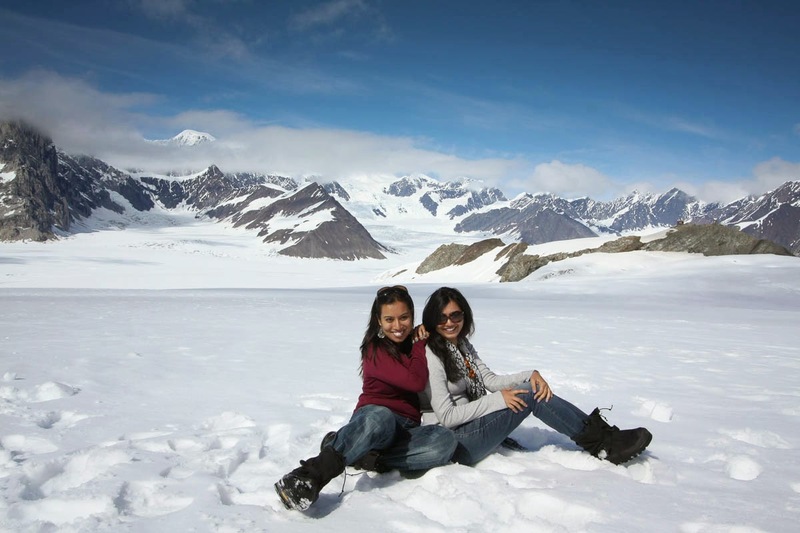 We traveled to Alaska in July 2012 with our friends Nirali and Kunal. We were debating between taking a cruise and taking a road trip. But given we had just 5 days, we decided to take a road trip as the cruises have a fixed schedules and are at least 7 days long! Day 0: Arrive late night in Anchoragre. Day 1: Leave early morning for Glacier Landing and Talkeetna. Day 2: Spend entire day in Denali National Park. 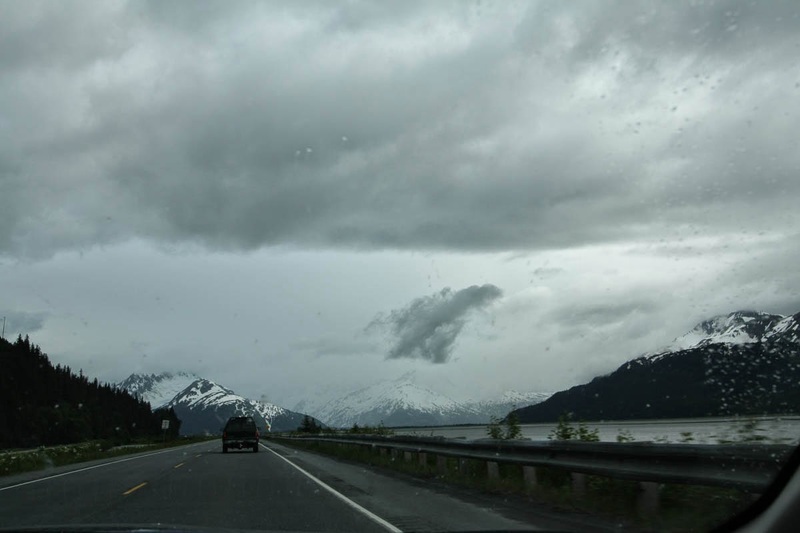 Day 3: Drive south towards Seward. Hike to exit glacier. Day 4: Drive to Portage. Half day glacier cruise. Drive back to Anchorage. Fairbanks(FAI): This is another popular airport on Alaskan mainland. A good option would be to fly in at ANC and fly out of FAI or vice versa. You gotta have a Moose picture! We landed well past midnight. Since we went in summer months, it never gets completely dark. At about 2 am, it was still twilight. We rented our car and drove to our hotel which was very close to the airport. We left early morning and drove to Talkeetna. 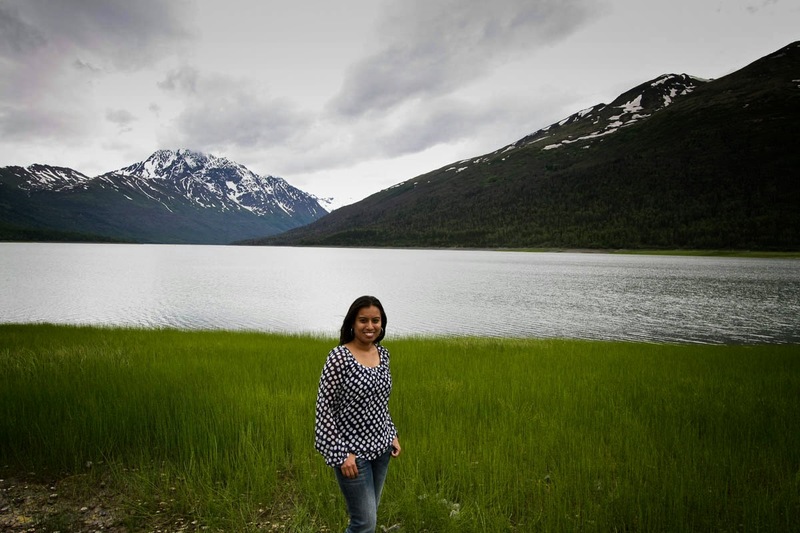 On our way, we stopped at Eklutna Lake. A beautiful landscape and a lot of activities to indulge. We also stopped at Thunderbird falls. It was a small hike to the falls. The view point was still a bit far from the falls, but a good option if you have time. We stopped at the Idiatrod Trail Sled Dog Museum as well on our way. But since it was summer months and no snow, there were no options for dog sled rides. Drive to Talkeetna was very scenic. We stopped a few times on our way and took a lot of picture. Talkeetna is a small town on your way to Denali National Park. We toured the town for a little while and ate at some lunch trucks. It was very lively place and we spent some time by the riverside. Our intention to visit talkeetna was Glacier Landing. This was the most breathtaking experience during our entire trip. 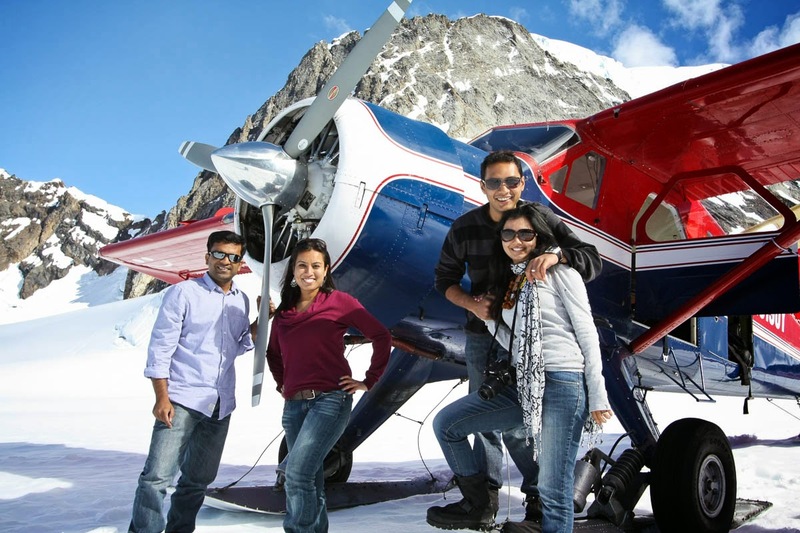 A small plane lands on a glacier and you have a few minutes to be just surrounded by snow. It is so surreal and serene that I would list it as a must do. Our reservations were already made. 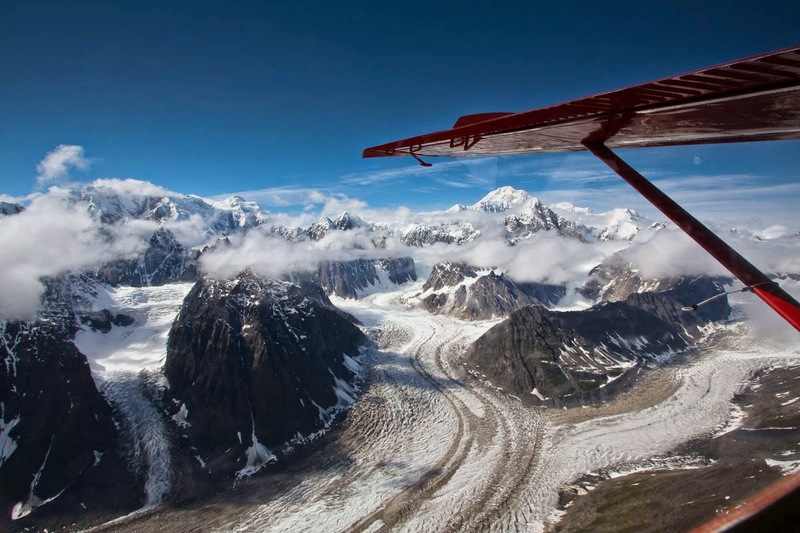 We used Talkeetna Air taxi. There are other options, they are almost the same and offer almost the same tour. Infact their offices are next to each other and they use the same air strip. 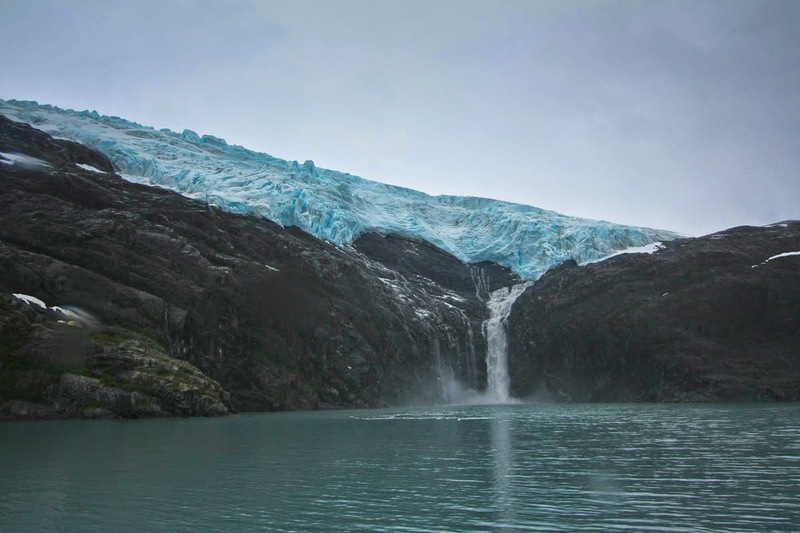 We booked the shortest tour in this list with glacier landing. We stayed overnight at Talkeetna Alaskan Lodge. The lobby offered beautiful views of the Denali peak and the entire mountain range. Best part of traveling in summer is that it is still bright day light till about 10 pm and you can indulge in outdoor activities. We drove from Talkeetna to Denali National Park on Day 2. 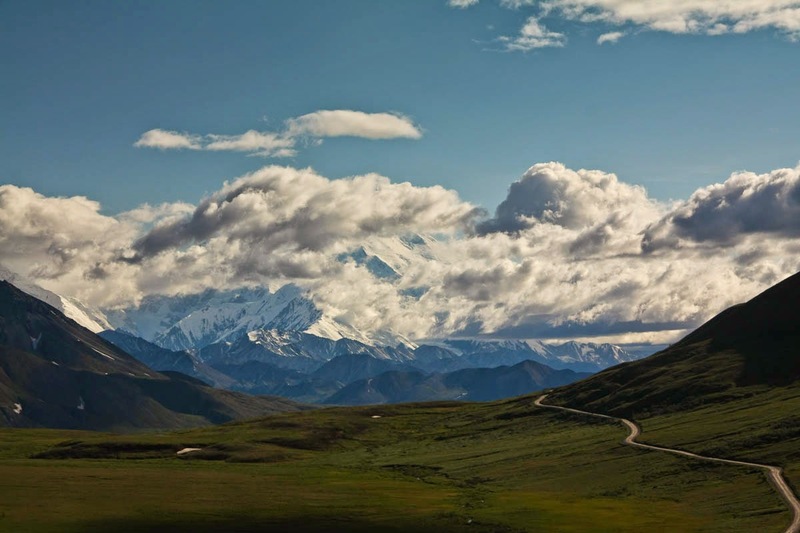 There are a few options on how to explore Denali National Park. If you plan to take your own vehicle inside the park, you cannot drive beyond a 15 miles. So if you intend to travel beyond 15 miles, you would have to either take the bus tour or take shuttles between various stops. If you plan on taking a bus tour, there are three options. 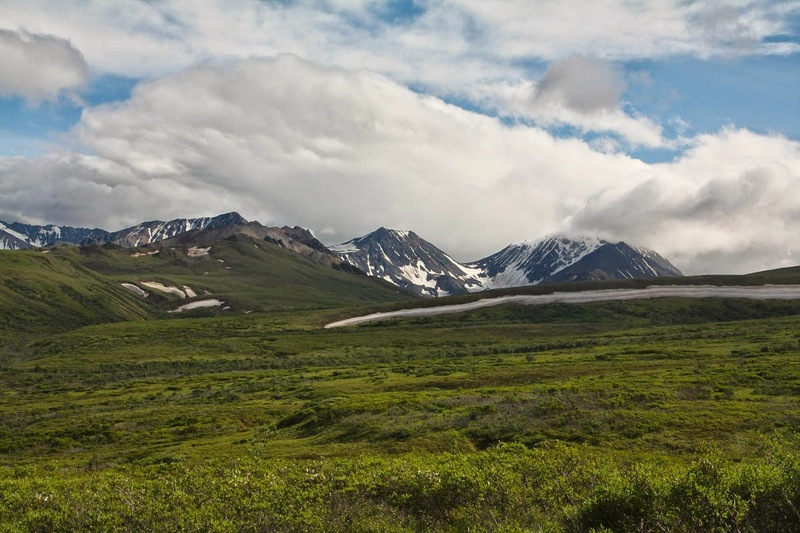 We took the second options which was a 8 hour long Tundra Wilderness Tour. We did see a variety of beautiful landscapes. But we were disappointed with the amount of wildlife we saw. We did see a few bears and mountain goats along with Moose and Caribous, but they were mostly on a hilltop far far away. We had to use binoculars. Probably, we had higher expectations. We stayed at McKinley Village Lodge for the night which was outside the park and had good food to offer. This was the day for our long drive to Seward from Denali Park. The drive was long but we stopped at quite a few vista points. The drive get prettier and prettier after Anchorage. It is just surreal and the most beautiful drive I have seen in North America. I would say it is far far better than Hwy 1 drive in California. We took a stop at Alaskan Wildlife Conservation Center. It is a small zoo. 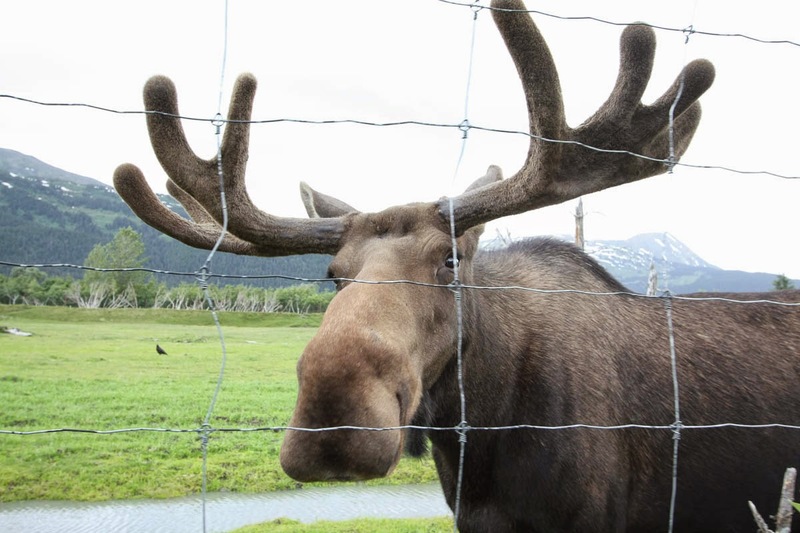 You pay a little entry fee and the tour takes about an hour or so, but you get to quite a few animals up close which you saw far away in Denali! 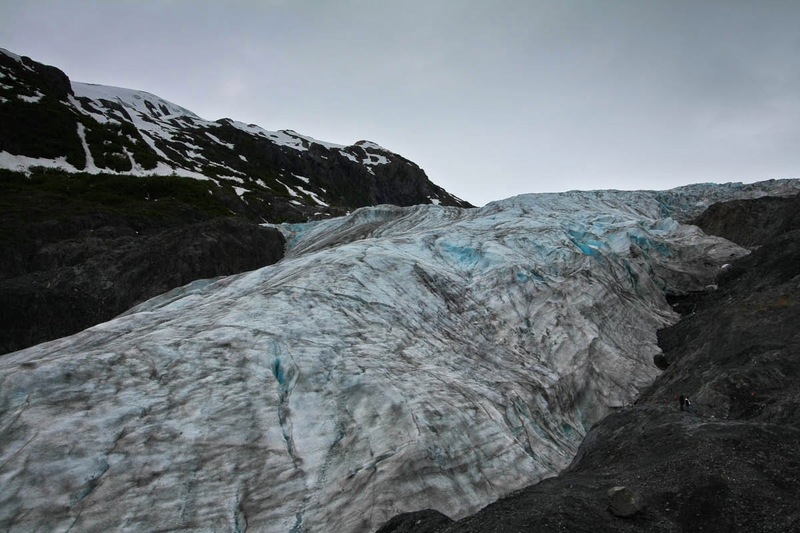 Exit Glacier is one of the few glaciers easily accessible on foot. Search for Exit glacier hike in Kenai Fjords National Park. 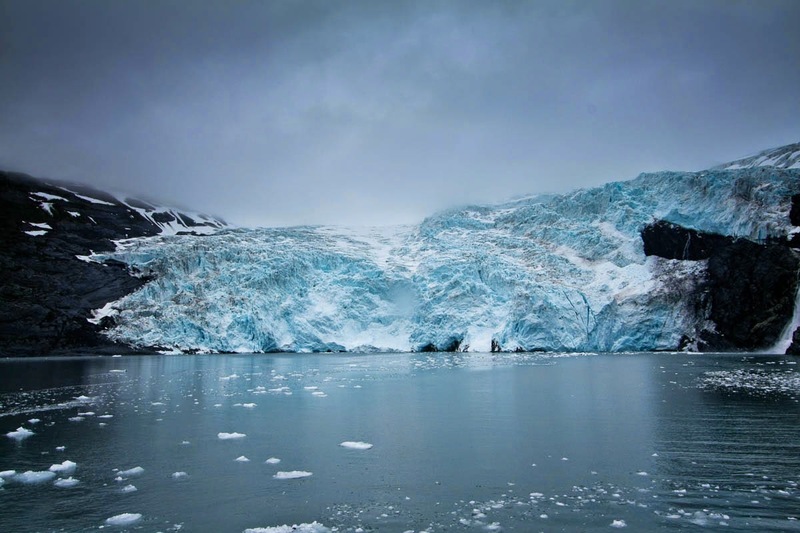 It is most up-close and personal view of a glacier you will ever get. 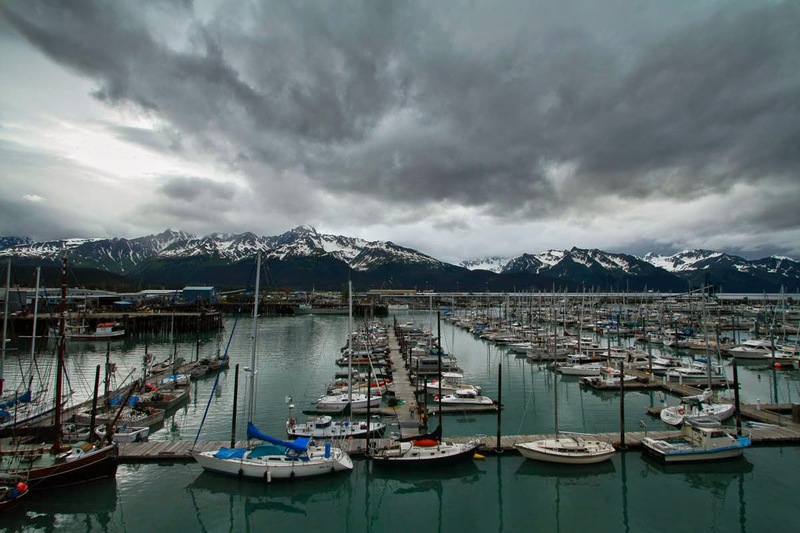 We stayed at the Holiday Inn, Seward for the night. Our room had a beautiful view of the pier surrounded by small mountains. We drove to Portage from Seward. It is about mid way from Seward to Anchorage. There is a very popular hike by the Portage Lake, which we were intending to do. But the weather wasn't on our side and it started raining so we decided to ditch the hike. We did a half day cruise. It was pretty good. We got to see calving and cruises from here are your best bets. Here is a youtube video to show you how magnificent it is.No sea sickness at all. It was neat and clean and good fun. There were two options when we booked. One was for half a day other was for a longer day with more glaciers. We booked the Glacier Quest cruise because we were short on time. Here are their routes. It was lot of fun as we spotted many sea otters and a couple of porpoises. American bald eagles are easily spotted here. But the glacier views are phenomenal! Other option is to take a cruise from Seward to Resurrection bay, you will see more wildlife here. Keep in mind that that there is a one way tunnel to get to Portage/William Sound which opens for traffic every hour only; so you don't want to be stuck waiting for that when you go to Portage/William Sound. Look at this link for details. We drove to Anchorage late in the evening. Walked around the downtown and relaxed for our flight the next day. It was tough to find good eating options around. Anchorage had one very awesome Indian restaurant. I even yelped about it! Bombay Deluxe. Otherwise, you can find Denny's and Subway at most of the places. The usual American fast food restaurants. There was this truck in Talkeetna- which had awesome garlic-spinach bread or something. There are small restaurants everywhere otherwise. You will find some veggie options in middle of all the sea food. 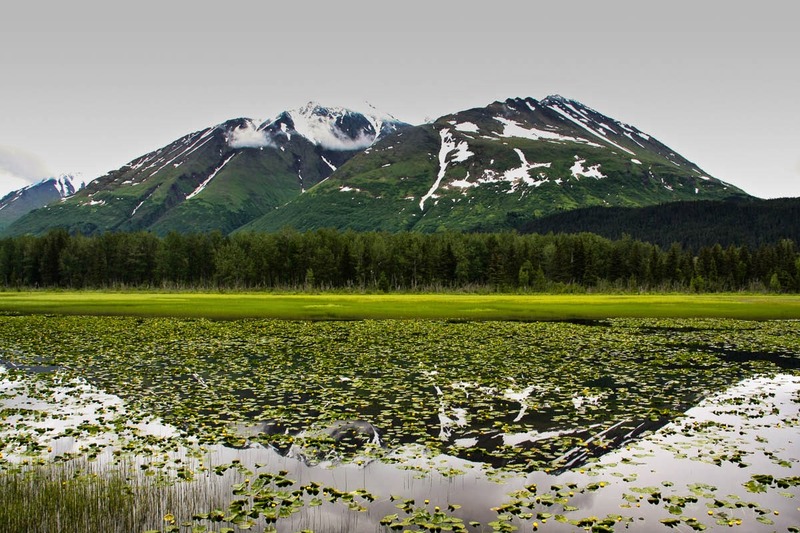 Train rides: Alaskan railroad is very popular and a luxury rail that runs across the Alaskan mainland. Since we were planning on renting a car and had a time crunch we did not opt for train. Fairbanks: Driving up to Arctic circle and then up to the Arctic ocean is also a check box time you may want to do if you go to Fairbanks. If you plan to visit in winter months, you may also get a chance to go see Aurora Borealis. Juneau/Ketchikan: There are quite a few cities which are not connected by road to the Alaskan mainland. You need to either fly to these places or take a cruise. Next time!